Sonja is a very convincing liar. Everything about her, from the successful business woman who her documents say she is, to the classy way she looks, it is all lies. Sonja is a high-class drug smuggler and to be honest she is bloody good at what she does. At just a phone call Sonja can be jetting off anywhere in the world to smuggle cocaine back into her home country of Iceland. Talk about crafty, phew I won’t even glance at a stranger in an airport ever again never mind talk to one! This is one very determined lady and boy is she ingenious in the ways she works. I think that it is impossible not to like Sonja especially as the story unfolds. Now the story is told through three people, another being Bragi, a very wise old Customs Officer with a feel for travellers that just aren’t right. Sonja is like a beacon to him that flashes come and get me. Bragi becomes quite a determined fellow to catch this lady traveller out before he retires. It all makes for super reading. Agla is the third cog in this wheel, the lady Sonja’s husband Adam found in bed with her and the final straw why Sonja and Adam’s marriage ended which resulted in him winning custody of their son. Agla also works at the bank where Adam works. What a fabulous story. My heart raced at every airport arrival, every heart wrenching visit Sonja had with her son and every time she met the man she worked for. Loved the tenderness of Bragi, the uncertainty of Alga and the strength of Sonja. All caught in their own snares. I really think I came face to face with what evil looks like in this book and it took my breath. Just Brilliant. This is all I want in a book. I am also ecstatic that this is the first of three books. Icelandic crime-writer Lilja Sigurdardóttir was born in the town of Akranes in 1972 and raised in Mexico, Sweden, Spain and Iceland. 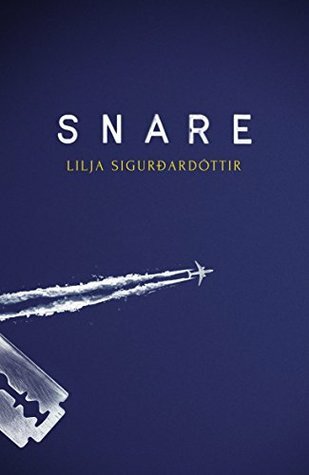 An award-winning playwright, Lilja has written four crime novels, with Snare, the first in a new series, hitting bestseller lists worldwide. Translation rights have been sold in eight countries to date, and film rights have been bought by Palomar Pictures in California. Lilja has a background in education and has worked in evaluation and quality control for preschools in recent years. She lives in Reykjavík with her partner.